This beanie was one of the first gifts I made last year. It was for my travel buddy who loved cherry blossoms so much, so when I was browsing for crochet projects and I chanced upon this pattern for cherry blossoms, I thought I'd make her something with cherry blossoms in it. And what else should it be but a beanie! I think it's great for travelling especially to cold places, and also great for hiding your hair after sleepless nights of taking care of your child. Yes, she has a little one, and I also made her something (that I will be posting in a couple of weeks). I'm trying hard to justify my decision of giving her a beanie, and while all these things that I said are true, I have to admit that I chose to make her a beanie because it's fast and simple. Hahaha! But it's also useful, right? I originally intended to give her this beanie as a birthday present (her birthday was on November). However, I also had plans on making beanies for our other friends, and then I realized! If I gave her this beanie on her birthday, I would have to give her something else for Christmas, while everyone else will be getting beanies. She will be the odd one out and I don't want that; I like giving almost the same gifts to my friends, and it's complicated to explain why (haha!). Also, if I gave her a beanie before Christmas and our friends find out about it, they will have an idea that I will also be giving them the same thing for Christmas. No more surprise! So finally I decided against it, and although I finished her beanie before her birthday, I held on to it and gave it to her for Christmas. 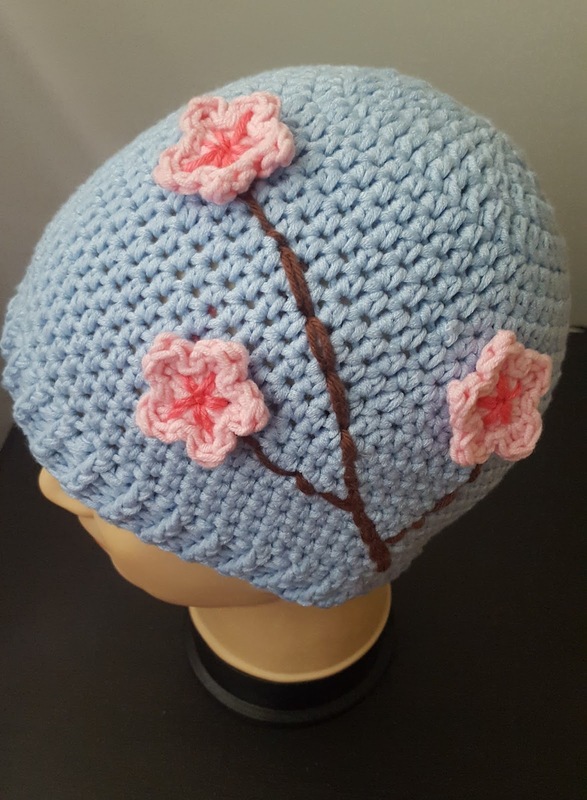 Note: In the cherry blossom pattern I used (found below), it required a 3.5mm hook. You can opt to use this; I only used 4mm since I didn't have a 3.5mm yarn on hand. Using the blue yarn and your 5mm hook, make a magic ring. Rows 13 - 18: ch2, hdc all around. Join with a sl st to the first hdc. Row 20: ch 2, *fpdc in the next st, bpdc in the next* repeat around. Join with a sl st to the first fpdc. 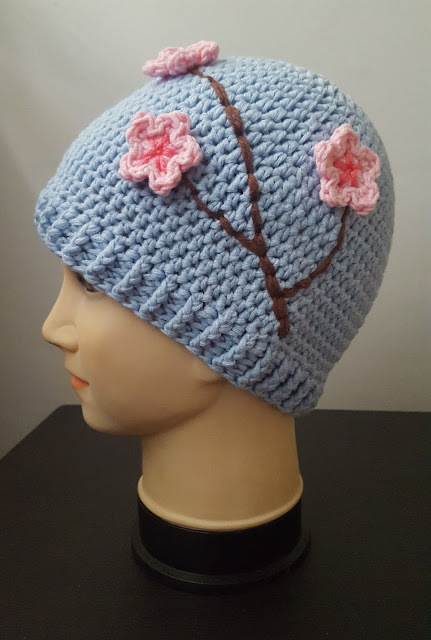 For the cherry blossoms, I used the pattern I found here. It's very simple and easy. 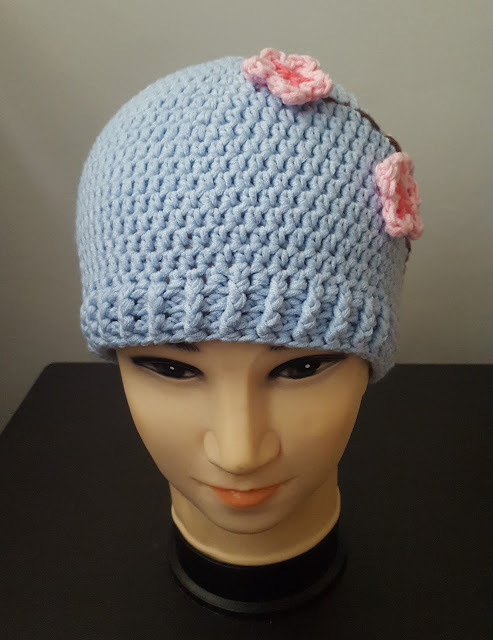 For my beanie, I made 3 flowers; you can choose to add more flowers if you want to, especially if you used a 3.5mm hook and made smaller flowers. For the branch, I used the brown yarn to stitch a branch shape on one side of the beanie. I just winged it, making the lower part of the branch a bit thicker than the tips. I made 3 branch tips, and of course you can put more if you want. I attached a flower to each tip of the branch; and again if you want, you can add more flowers on the branches as well. And that's it! It's pretty simple, although I admit I struggled a bit in making the branches. I had to redo it multiple times since I'm not really good at sewing. I like how the ribbed brim of the beanie turned out; it was my first time using the fpdc and bpdc stitches. Before this, I only knew how to make the ribbed effect by stitching on the back loops only, but that will only work if you're making the beanie from top to bottom. So for this beanie, I wasn't only able to finish a gift for a friend, but I also learned something new. As you can see in the picture, the cherry blossom branch is a bit subtle especially if it's on the side of the head. You can make the cherry blossom more pronounced by adding more sub-branches, and then attaching flowers on each additional branch. Before I end this post, I just want to share one brilliant Japanese concept, mono no aware, a term that describes the impermanence of life. Cherry blossoms only bloom for about a week each year, making it special and very much valued. If we think about it, our lives can be viewed the same. Just like the sakura, life is delicate and beautiful, and tragically short. Mono no Aware. Thank you to my friend Summer for sharing this concept with me. Photo by me in Tokyo, 2014.